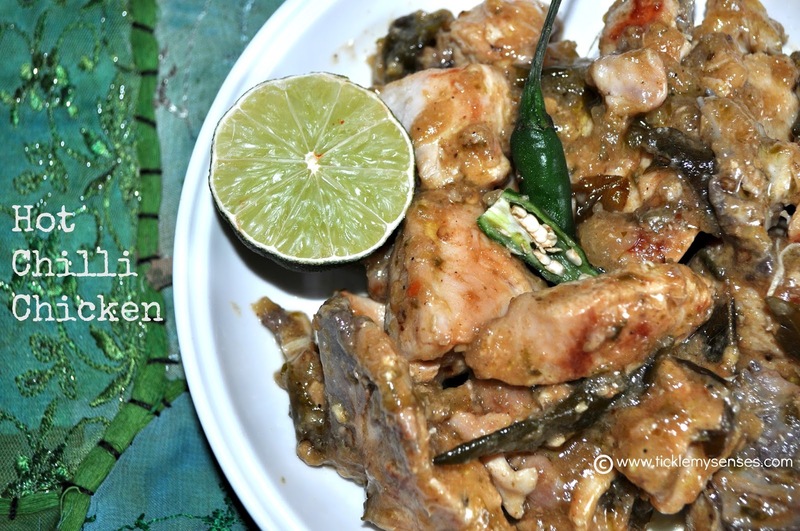 Tickle My Senses: South Indian Green Chilli Chicken Dry. Do you ever go through phases where you would really like to enjoy a chilli hot meal, so hot that your nose is running, eyes are tearing and taste buds are losing the will to live?? 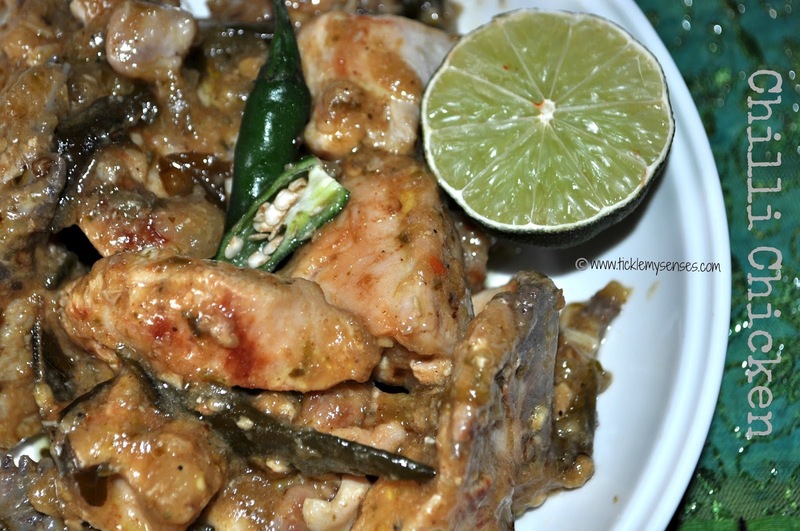 Well thankfully I rarely go through these 'hot chilli phases', but when I do, the dish I instantly think of is the 'Chilli Chicken Dry dish' served at most Andhra Restaurants in Bangalore, India. ...if that makes any sense at all ! Well this is a pretty decent version of the original HOT Andhra restaurant version. You might actually enjoy the combination of heat, tang and spices without blowing your lid off. Those with a milder palate might want to pass this one. To Make Chilli Chicken Dry. Green chilies slit (remove the seeds): 6 nos. 1. Chop the green chillies and onions to be used in the marinade. Add to a blender with all the other marinade ingredients and grind to a fine paste without adding any water. Add enough salt. Marinade the cleaned and cut chicken in this ground paste. 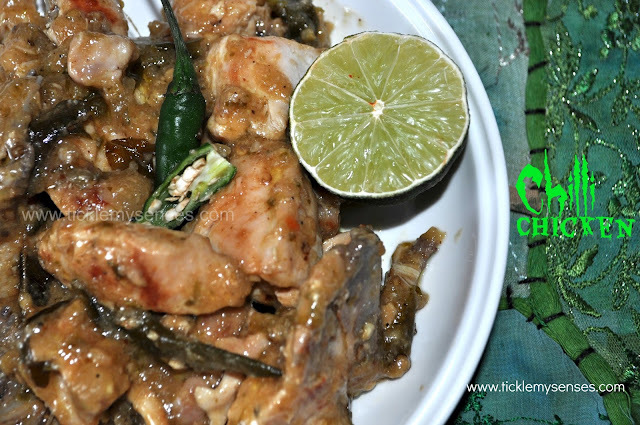 Pour a tbsp of melted ghee or oil over the chicken, coat well, cover the bowl with cling film and allow to marinade for atleast 3-4 hours or better still overnight in the fridge. 2. Next day take chicken out of the fridge an hour or so before cooking to allow it to come to room temperature for uniform cooking. Take a wide bottom nonstick pan add all the marinaded chicken pieces, close lid and allow the chicken to cook well on a medium flame adding 2-3 tbsps of water if needed, stirring in between. When chicken has fully cooked turn off the flame. 3. In another non stick pan take a tbsp of ghee or oil, add the cumin seeds, curry leaves and slit green chillies and fry for a minute, then add the chopped ginger and garlic and stir fry fry till garlic slightly softens. Add the chicken with any remaining gravy and stir fry for 3-4 minutes. Add the bottled green chilli sauce around 2-3 tbsps, toss the chicken well in the sauce, taste for salt and sourness, adjust accordingly.To get the restaurant finish you could dissolve a tsp of cornflour in 2 tbsps of water and pour this into the chicken sauce, allow the sauce to thicken toss the chicken well to coat. Serve hot with chinese fried rice. For those of you who dare to try this dish out, I would love to know how you got on.